It’s here…Autumn. The footloose days of summer are behind us and families of school aged children are getting back into their school year routine. It’s the back-to-school mad rush to be sure your little student has all of the right gear to start the school year off right. If your child loves sports, make sure they have the right gear for this too, especially if they play competitive or team sports. Injury prevention is essential, let them go out on their playing field and give it their all with the proper precautions to protect them. Schools generally require Sports Physicals. This is a great start, being sure Jen and Joe are in good physical shape before Game Day. As a parent, it is up to you to be sure the examiner has full information of your child’s medical history and issues so they are properly addressed. Getting them on the playing field is one goal, keeping them safe and well is the primary one. The Centers for Disease Control and Prevention estimates that nationwide 300,000 concussions occur during sports related activities, with more than 62,000 concussions annually in high school contact sports. Athletes, coaches, and the parents or guardians should be educated about the nature and treatment of sports related concussions and other head injuries. A student who may have sustained a concussion should be immediately removed from competition or practice. The same can be said for sprains and fractures to avoid further injury or complications. P Protective Gear is so important, don’t use hand-me-downs if possible. Get your child the most effective choice there is. O Offset the calories burned with a well-balanced, nutritional diet. Lead them to healthy choices that will give them enough energy. Avoid supplements and energy boosters as they aren’t always guaranteed to be safe. R Rest and relaxation is a good choice for downtime. Our kids tend to overextend themselves. Exhaustion leads to illness and careless errors on and off the field. T Team spirit and the right attitude is what Sportsmanship is about. You can be an aggressive player without aggressive behavior. Using the proper rules and techniques in the game avoids injuries and bad feelings. S Seek help if an injury occurs. Your child may want to get right back into the game but you need to be sure the situation is properly assessed. Sprains, strains, possible fractures, head injuries, concussion, heat and hydration can all lead to big problems if ignored. Dr. Marshall P. Allegra is a board-certified orthopedic surgeon in private practice in Monmouth County for over 25 years. 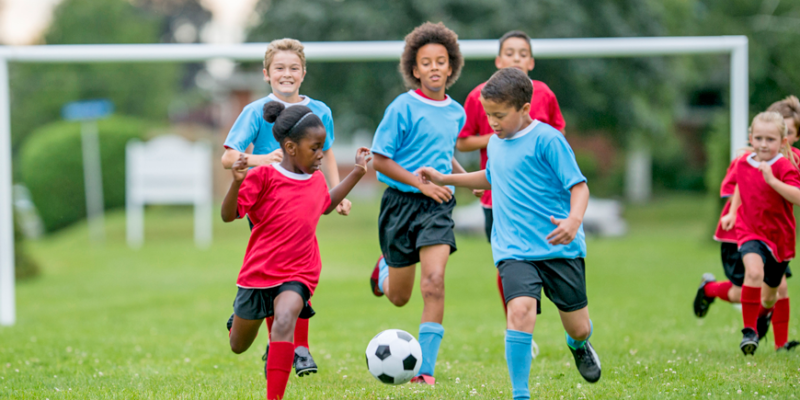 As an experienced diagnostician, Dr. Allegra can expertly determine sports-induced injuries, and then determine the best treatment options to return your student back to the playing field, restoring functionality and range of motion as quickly as possible and avoiding long term implications. Overuse injuries in young athletes can be overuse of the bones, muscles, and tendons. This is roughly half of the sports injuries that middle school and high school student athletes suffer from. These can possibly be prevented by significant rest periods, and appropriate training to optimally prepare the athlete for the stresses that their sport will put on their body. Traumatic injuries happen when there is a violent collision between the athlete with another athlete, equipment or even the ground. These injuries impact bones, muscles, ligaments, and tendons. Movements such as collisions, cutting, landing, pivoting, and over-striding can lead to a traumatic injury.